What? Oh? Right. Comics. 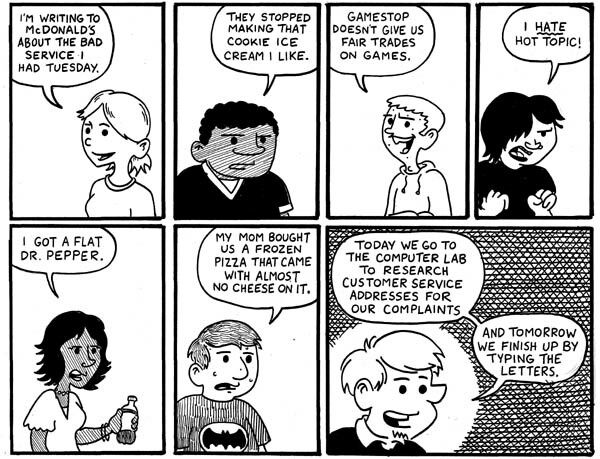 Remember comics? I used to draw them? 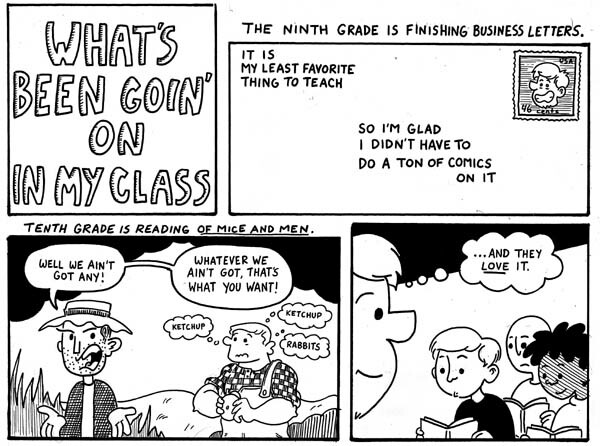 Well, here we are, 2011… and this is the 50th teaching journal comic of this school year. What a milestone. What an amazing… hell, this is probably THE most amazing milestone that you will be witness to today. Just take a moment. Soak it in. Fifty. Wow. Heavy. I thought a recap would be in order as I haven’t posted a new comic in a few weeks. 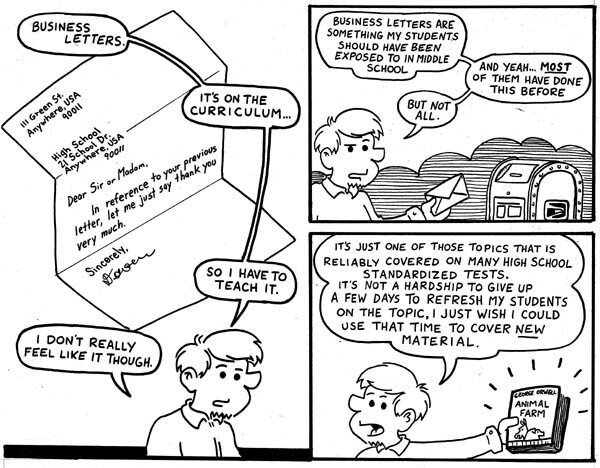 If you should happen to be interested in seeing some comics about teaching the business letter to 14 year olds, I’ve gone back and tagged the ones I did last year. One of my New Year’s resolutions with the comic is to start tagging comics a little more effectively. (1) We’ve been reading Animal Farm for the past three weeks. (2) In addition, I decided to try and quickly knock out a three-day business letter activity in the middle of reading Animal Farm. (3) The school had a snow day and TWO two-hour delays in a row, throwing all planning and organization for thos projects into disarray. 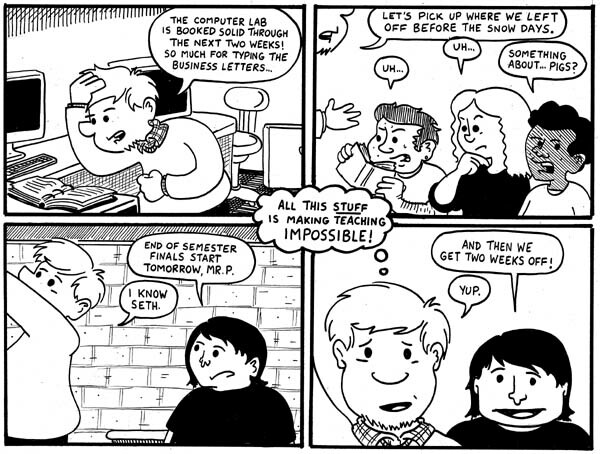 I should probably also mention that this comic takes place *right* before Christmas Break (that’s the two weeks off to which Seth is referring). I’m trying to avoid direct references to the holidays in the comics I post here, lest they seem even more dated then they are… but I’ve drawn a couple of Halloween/Thanksgiving/Christmas type strips that will be posted in the inevitable and unnecessary print collection somewhere down the road. I apologize for being in my boxers in this comic. Not to cram it down anyone’s eyeballs, but DonorsChoose just did something really helpful for people like me who like to cart out their projects for folks by letting us pick a normal URL for our Giving Pages. Before I had to cut and paste a whole field of numbers and backslashes that I couldn’t commit to memory if I were some kind of genius. …and I’ll add it as a link somewhere on the site this weekend (along with the long-promised list of comic sites) so I can stop with these incessant reminders. If you have a chance, please check out my DonorsChoose projects! Donations are greatly appreciated, and one project is only about $100 dollars away from completion! You are currently browsing the archives for the business letter category.